BONUS: 10% DISCOUNT VOUCHER AVAILABLE FOR MY READERS AT THE END OF POST! I have been thrown this question many times by my readers and friends on where would be the ideal place for dining if they would want to stay healthy without having their worries over their cholesterol, triglycerides, fat or even glucose levels. As we know, Penang is the food paradise of Malaysia and dining healthily would be almost impossible unless we cook our own food at home. This would be quite a hassle for most modern families as most of them are working individuals. Ever since my first visit to Young Heart Restaurant (养心殿) earlier this year, I knew that this would be the ideal restaurant for those people around town who would yearn for some home cooked food but without having the time to cook in. Most of the ingredients used here are fresh from the nearby wet market and they use rock sugar instead in their beverages. Some of the dishes are even traditionally prepared with the usage of charcoal. So, what’s new in the recently revamped menu as well as the facilities? It actually had some of the items from the earlier menu with some newly created items added in to make the menu a more complete one for all ages such as Junior Meal and Vegetarian Meal. On top of that, they had set up a cozy and air-conditioned dining room upstairs with a DVD player and TV for the comfort and relaxation of a small private event of up to 12 persons. Booking has to be made in advance. A group of us managed to relax ourselves prior to the food feasting with some hot beverages. To start off, we had Ginseng Oolong Tea (人參烏龍茶-RM15.00 for 1-2pax with unlimited refills). The bulb shaped oolong tea leaves mixed with some powdered ginseng was indeed refreshing. It surely booted out the tiredness in me after weeks of endless projects. The next pot was from one of our selections in the Natural Flower Tea list – Rosehip, Hibiscus and Green Apple Tea (雙花蘋果茶-RM9.00). The tea tasted somewhat like a rosy flavored blackcurrant drink but with the sour but fragrant taste from the green apple slices. Some of us preferred to add in some rock sugar syrup to sweeten up the sourness but I like it the way it is – natural. Rosehip has been used for generations to strengthen the body’s resistance to infection, reinforces digestive function, combats all kinds of illnesses with fever, flushes out the kidneys and urinary tract and relieves mild rheumatic pain. The fleshy red sepals of the Hibiscus flowers (Malaysian National Flower) have been used as traditional remedies against cough, dyspepsia, fever and hypertension. With the combination of vitamin rich green apples, this beverage sure would help in a person’s general health. Do check out with Ms Ann on Stevia rebaudiana Bertoni or commonly known as Stevia aka Sweet Leaf, the FDA approved natural substitute for sugar. They do have the dried leaves form here for your tea. The meal started off with a bowl of carefully monitored charcoal boiled Soup of the Day – Lotus Roots & Peanuts Soup (蓮藕花生湯-RM6.00(M)/RM9.00(L)) as starter. It was exactly how Grandma would cook it. The collagen filled soup had many ingredients and herbs that constituted to its richness in taste. Prominently you would see some lotus root slices, fresh peanuts, dried cuttle fish, chicken feet with the rich taste coming from the red dates (紅棗), Angelica sinensis (Dong Quai-當歸), dried Ophiopogon japonicus tuber (Mai Dong-麥冬) and dried Codonopsis pilosula (Dang Shen-黨參). The soup was so rich that I’m sure I can form gelatin if chilled properly. This is a must have for soup lovers. 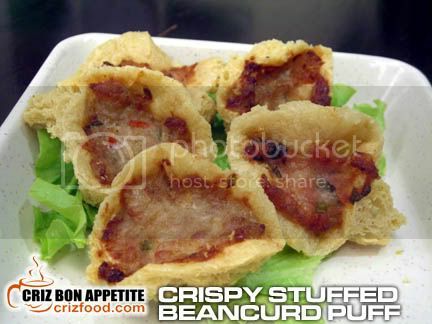 Deep Fried Prawn Dumpling (蝦仁炸餃-RM6.00/4pcs) was served next as appetizers. The golden colored mixed minced meat and prawn filled dumplings alone were impressive with some tails sticking out. The exterior remained its crunchiness while the interior had the required moisture in it. These would be great to be taken with some Thai chili sauce. Although I had many encounters with a chayote fruit (佛手瓜) in fresh and preserved ways before, the next dish came as a surprise as I had not seen a live version of the shoots (龍鬚菜) except from some Taiwanese TV channels. The Stir Fry Chayote Leaves with Roasted Duck Meat (RM5.00(M)+RM4.00(Duck Meat)/RM8.00(L)-龍鬚菜炒燒鴨肉) was awesome with the fragrantly roasted duck meat. The gravy of the dish was mildly flavored with some basic seasoning. Some might want their vegetables added with some meat or seafood but I love mine to be plain. 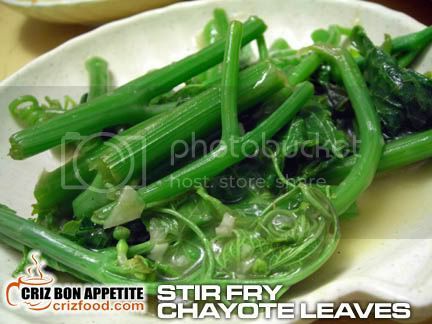 In fact, I found that I love the plain Stir Fry Chayote (清炒龍鬚菜) tasted better, considering that I can have the actual bite of these fibrous vegetable in their natural state. Moreover, too much of duck meat would not be good for health as they are high in fat and uric acid, leading to gout, kidney stone, diabetes type 2 and many other diseases. On the other hand, the fruits and leaves of a chayote plant have diuretic, cardiovascular and anti-inflammatory properties. Even the leaves that had been made into tea had been practiced in the treatment of arteriosclerosis, hypertension and to dissolve kidney stones. Maybe for this case, the combination of duck meat and chayote leaves might not be so bad after all. The next few orders consisted rice and noodles. Some came from the handmade noodles, rice and personal meal sections. Each dish in the Personal Meal section would come with some meat, a vegetable of the day plus a bowl of white rice. In case you prefer their handmade noodles instead of white rice, just pay an additional RM1.00 to the price. On top of that, another RM1.00 extra would make you eligible for a drink of the day (if you dine between 12noon and 2.00pm). The first rice dish made me broke a heart. LOL! The Hearty Pumpkin Fried Rice (愛心金瓜炒飯-RM7.80) indeed came in the shape of a heart and I was quite reluctant to be the first one to break it apart. Hmm… I forgot who did that first! Haha! Anyway, the fried rice had the required Wok Hei (high heated cooking) as each grain of rice was well fragranced with the minimal seasoning and yet providing the fresh taste of the small pumpkin cubes and shredded carrots within. The fried rice came garnished with some fried shallots, cucumber slices, a set of specially and freshly seasoned wings and a dish of vegetable of the day. The chicken wings were delicious and were just as good as the Kaffir leaves enhanced chicken wings we had earlier this year. The next rice dish was the Lotus Roots & Wax Sausage Fried Rice (莲藕腊肠炒饭-RM8.80). Since fresh lotus roots are bland in taste, the combination of chopped wax sausages and some shredded carrots added that special touch to boost up the overall taste of the “wok hei” filled fried rice. This dish tasted saltier compared to the sweeter pumpkin fried rice and I love this more. The order also came with a separated plate of the vegetable of the day. For those spicy food lovers, you would love the next handmade noodles as well. Fiery Hot Noodles (紅油拌麵-RM8.80) was the name of the noodles I had ordered but it was not as fiery hot as I had expected. One sauce dish of some dried shrimp enhanced chili paste in red hot oil was kid’s stuff to me. The next full dish had my tongue burning and ears having steams. I just could not believe how anyone could gobble down such hot stuff? Anyway, I survived the ordeal as I was not in tears as my dinner the night before. That hotness was Level 5! LOL! It’s actually up to us to adjust our own chili intake but I was a bit too adventurous. The noodles came with some minced meat, a semi cooked omelette, fried anchovies and garnished with lots of chopped spring onions and lettuce. This was in fact my most loved noodles so far in this restaurant. I simply love the taste! A seafood dish was next – Pan Fried Salmon Head (豉油王煎三文魚頭-RM15.00/half head). 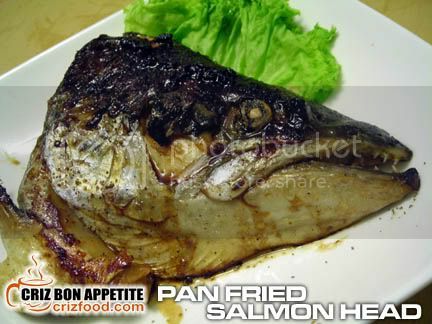 The salmon fish head was grilled in a specially prepared sweet soy sauce. Although I do not fancy fish head a lot, I found the fish to be real “fresh” amongst those frozen ones I had tried before. LOL! It was indeed well prepared with its juices still maintained within. Well, my preference would still be on sashimi and sushi over this spiky teethed fish. “OMG! What a pathetic fella! Who asked you to stuff yourself with so much pickled cabbage until you end up on the table?” Haha! The Pickled Cabbage Stuffed Chicken (梅菜雞 (須預定)-RM28.00/whole bird (pre-booking needed)) really had that miserable look on its face after so many hours of steaming. Overall, the taste was just normal and the pickled cabbage was rather sweet to my liking. Anyhow the management had rectified the problem as the brand of pickled cabbage used that night was sweeter than others. Moreover, the bird was a bit too large for the fragrance from the pickled cabbage to seep right into the meat. Let’s hope it would be better during my next visit. Well, this bird can feed 4-6 persons and the price for so much meat was way much cheaper than the “one person share” salted chicken I bought from Ipoh, Perak which cost me RM16 per bird. A bowl of hot steaming rice would be good with this dish. 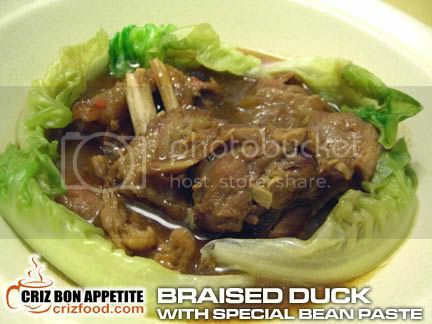 Braised Duck with Special Bean Paste (狗仔鸭（須預定）- RM20.00/half bird or RM38.00/whole bird (pre-booking needed)) was served next. The English name might sound normal but this was supposed to be a very strong herbs and spices recipe for “woof woof” during the olden China. Instead, duck has been used as both have the extra strong scent in the meat. Specially selected galangal ginger (南薑), star aniseed (八角), fermented bean sauce and chopped red chilies had been used in the preparation of this juicy and tender duck dish. 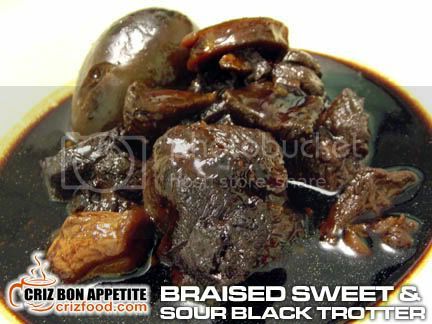 We also tried out their Braised Sweet & Sour Black Trotter (炭煮猪手醋-RM9.00(M)/RM16.00(L)). Although the meat served were healthily lean minus the fat, it somehow made the whole piece of meat rather hard. I would suggest that the fat be kept to maintain the tenderness of the meat. We could always get rid of them if we felt that they were bad for our health. Tenderizing the meat with grated ginger juice prior to cooking might help too. Moreover, the black vinegar used was a bit too overpowering as it was too sweet for our liking. The dish also lacked in the gingery taste from crushed old ginger. Young ginger would not be strong enough to boost up the taste. Since this was a precooked dish, heating up might be to be blamed as slow steaming and microwave would give a different meat texture. Let’s hope they would improve on this aspect of customer feedback for this dish soon. Desserts were wonderful as we had something unique. Firstly, it was the Old School Pan Fried Water Chestnut Cake (花香馬蹄糕-RM5.00/4pcs). The sweetness from the mixture of osmanthus (桂花) and chamomile (洋菊) brew, combined with some water chestnut flour, water chestnut slices plus a touch of rock sugar to make this jelly-like delicacy perfect. Each piece would be pan fried carefully to have that extra crispiness on the surface. This dessert was delicious although I personally felt that the texture should be a bit firmer by adding more water chestnut flour. Yellow petals with a tint of white stamens and purple anthers were what I saw in the next dessert. It has the beautiful colors of an attractive flower. The dessert was actually chilled Mango Puree and Sago Pudding (芒果花園-RM4.50/bowl) garnished with some diced red dragon fruit. It was awesome in every part of presentation and taste. 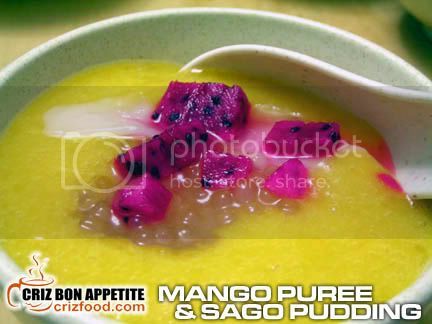 The sago was soft and mildly sweetened with some rock sugar syrup and combined with the mango puree, some fresh young coconut meat slices and juice plus the colorful red dragon fruit made this dessert the gem of the night. Perfect! If you happened to have the urge to grab something light for tea (between 3.00pm and 6.00pm), do look out for their coming soon promotion which would be their tea time deal for two at RM19.90. You could even grab some light snacks and finger food ranging from bean curds, dumplings, chicken wings or even their Crispy Bean Curd Puff (RM5.00/5pcs) with stuffed meat. Beverage wise, there are more iced, chilled, fresh, blended or beer for you to choose from. We had the Honey Lemon Sea Coconut (蜂蜜檸檬海椰-RM6.00). It would be best to consume this drink while there are still ice cubes as a warmer version would have the sour reaction of the lemon affecting the taste to be rather fermented. Anyway, it was nice that way too. The Pumpkin Soy Bean Milk (黃金豆漿-RM6.00) was my favorite as it was mildly sweetened with rock sugar syrup and it had that unique fresh taste from the blended ripe pumpkin. The Banana, Black Sesame & Soy Bean Milk (無間道-RM6.80) was another unique combination as it had the rich creamy taste of blended bananas combined with the fragrant fro the roasted black sesame seeds. For the juniors, the would surely like the Ice Blended Mixed Berry Vanilla drink (香草綜合莓果-RM6.00) – sweet but lovely. Reaching the restaurant would be easy if you are coming from Jalan Burmah into Jalan Cantonment. 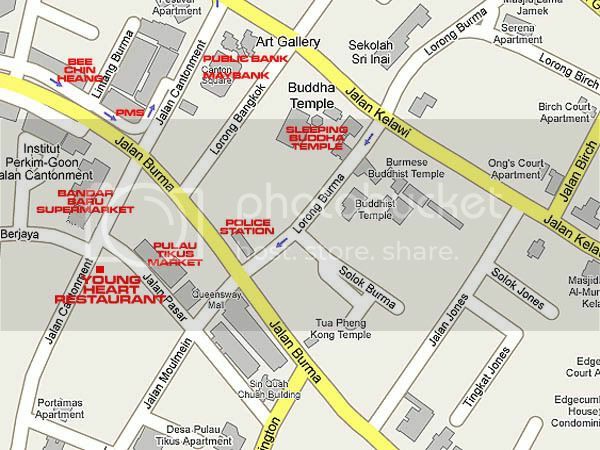 Just drive along Jalan Cantonment until you reach the first left junction (Pulau Tikus Market – Jalan Pasar). Just go further up after this junction and you will see Wisma Kota Kembar – Pulau Pinang-Medan Information and Promotion Centre on the corner lot. The restaurant is just next to this centre. There would be a 5% service charge for the food ordered here. Address: 44A, Jalan Cantonment, 10350 Penang, Malaysia. such high ratings from you. this is the second time you guys went for the review, right? the water chestnut cake seems familiar, Foh San Dim Sum also serving that. Well yes J but this time it’s with a revamped menu. 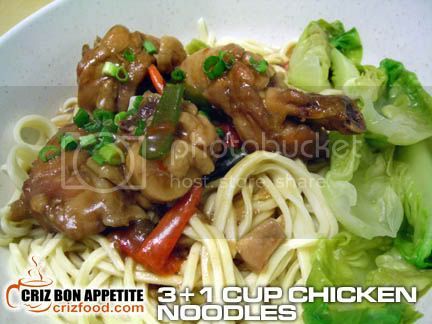 I love the healthy homecooked food there and the beverage has a lower sugar level with the usage of rock sugar syrup. looks a tad bit too healthy for me … i’m an unhealthy food eater!!! Your photo turned out good leh! I agree with you, eat healthily can be assured here. Thanks Carrie. I was a bit worried about the lighting then. I knew you would say that too or else you won’t be having so many visits until next week. Haha! Anyway, don’t forget to send some of those special flavored fried chicken wings to me. Hehe! duckie: healthy food doesn’t mean taste bad, they can cater for both eaters! their healthy food is in the sense of homely, less salt, sugar and oil. Yup… and they have lots of new concoction of beverages too. Do try out their pumpkin soy bean milk. It’s awesome! darn..had to miss this. I’m so sien.. Ivy kitchen, Young heart..all didnt get to go..grrr..
Well, different people have different taste bud and preference Steven and not everyone are as adventurous in food as we are. Young Heart Restaurant is still a restaurant to cater to everyone’s dream to have hot steaming home cooked food served on their dining table. Healthy food is just another part of their wonderful services to cater to those people who needed that special attention in their diet. After all, they do have the necessary herbs and ingredients to boost up the body immune system as well as for general health. the pan fried chestnut cake is something new! Normally they serve this cold in restaurants right ? 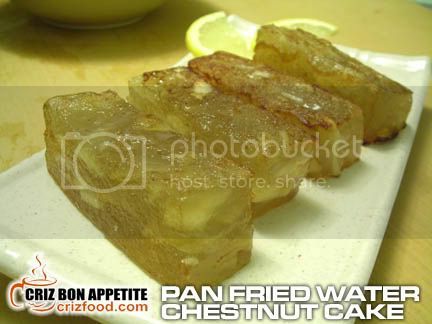 Pan Fried Water Chestnut Cake taste good? I would like to try out this one. I always spot this dessert in those TVB drama.